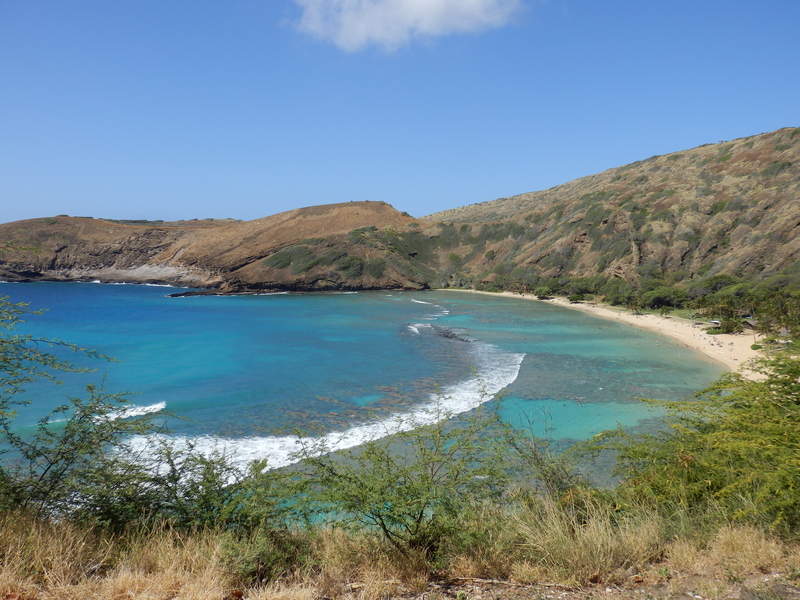 If your friends have gone to Honolulu, chances are they’ve spent a day in Hanauma Bay, a marine life sanctuary in eastern end of the island (Oahu). 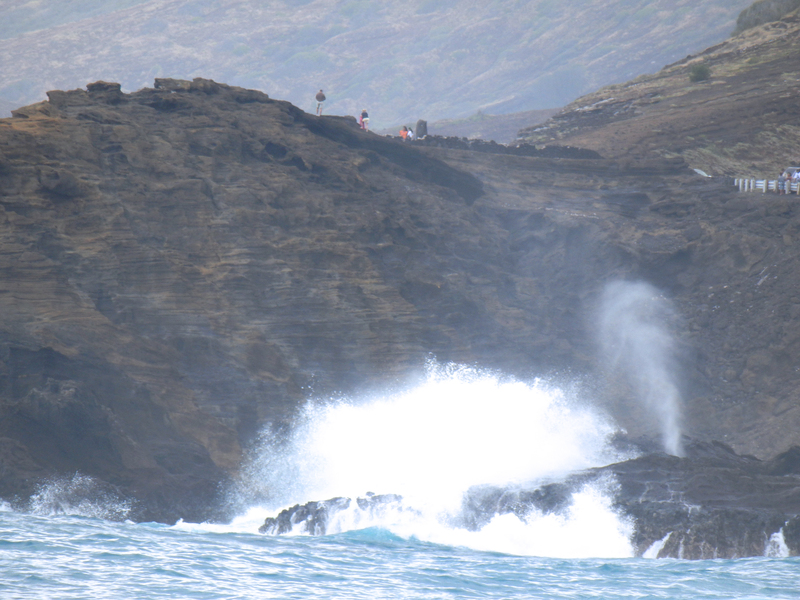 From Waikiki, you can drive east on HWY 1 and continue on through Kalanianaole HWY until you see signs for Hanauma Bay. The drive itself is quite scenic, with blue oceans on your right and volcanic mountains on your left. I suggest arriving early because parking can be a total b*tch if you come in the afternoon. To save money, bring your own lunch because concessions stands are very costly. If you are here to enjoy the view and relax, bring all the things you think you will need (towel, sunscreen, water, snack etc), which of course you can also buy from the shops there for oodles of money (a spray can of sunscreen cost us nearly $18USD…wtf). There are showers and washrooms so you’ll be quite comfortable. If you come early, you can find yourself a nice chunk of real estate under a tree. If you’re up for it, you can try your hand at snorkeling the bay. 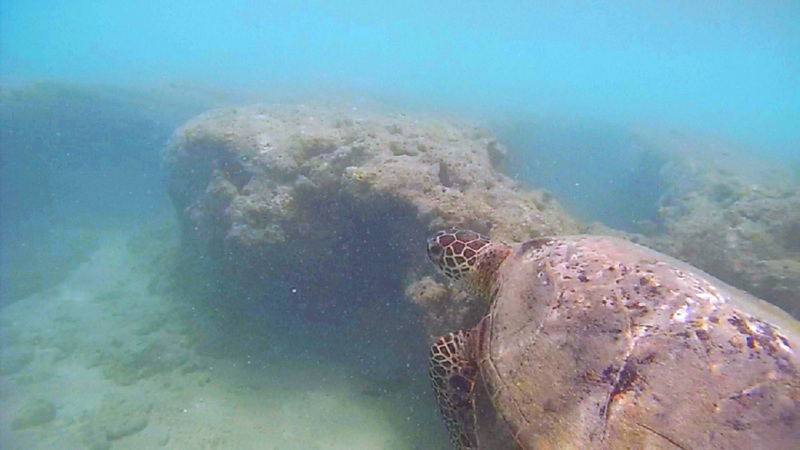 After almost 45 minutes of swimming around Hanauma Bay, I finally found a turtle while on my way back! Over top view of Hanauma Bay. Apparently its a partially collapsed volcano that turned into a bay. Personally, after doing SCUBA, I still can’t get the damn snorkel to work properly. I swallowed water many a times while trying to snorkel here. Just a few things to note, all equipment can be rented from little stand on the beach. If the surf has been pretty rough, the visibility will be bad (as it was when we went) cuz of all the sand and crap the waves kick up. However, you will still get a great view of the coral if you’re a good swimmer and can make it out further (most of the stuff is dead close by the beach). Lost of fish and if you’re really lucky, you might just catch a sea turtle! A note of caution, ALWAYS wear sunscreen and reapply, even if you’re trying to put on a tan. This tropical sun will burn through anything you put on fast, especially in the water. 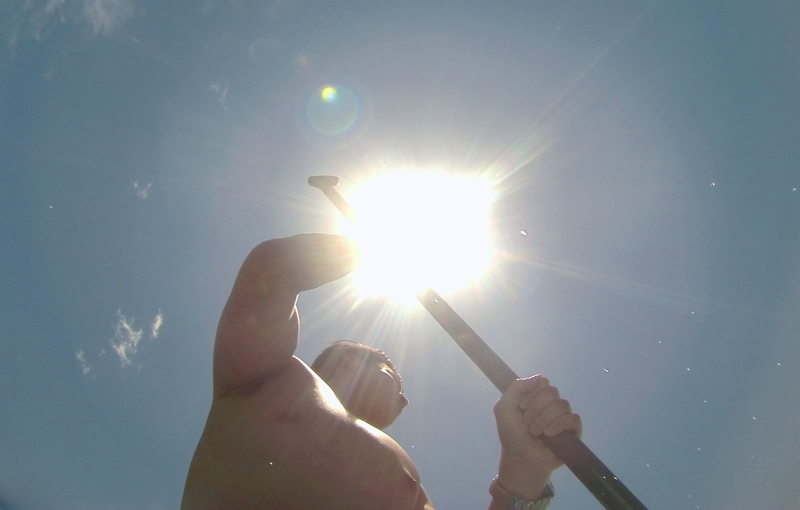 SUP stands for stand up paddling. You might have seen these around, where people stand on giant surfboards and use a paddle to propel themselves. Personally, the aversion I have for cold water prevents me from pursuing this awesome activity in Canada, but in Hawaii, where the water is warm and delightfully blue, it is not a problem. Cristina (my sister) and I did our first session at Ala Moana, a beach very close by to Waikiki where we stayed. We rented our boards from Girls Who Surf (hahaha I know…). Prices are fare and they offer a ride to the beach for a small charge. Ala Moana beach is a long, fairly straight stretch of beach and water. If you can imagine a rectangular pool of water, that’s what it looks like off the beach. Beyond that, there is an expanse of coral, making for very shallow water. Be VERY careful if you venture here because if a strong wave comes and knocks you over, you can easily scrape something on the sharp coral. Personally when I flipped, I grabbed onto my board to stay as horizontal as possible to prevent any scraping. We started paddling on our knees because this is much more stable. It’s really not too hard! And when you’re comfortable, balance yourself and jump onto your feet. Always keep your knees bent. 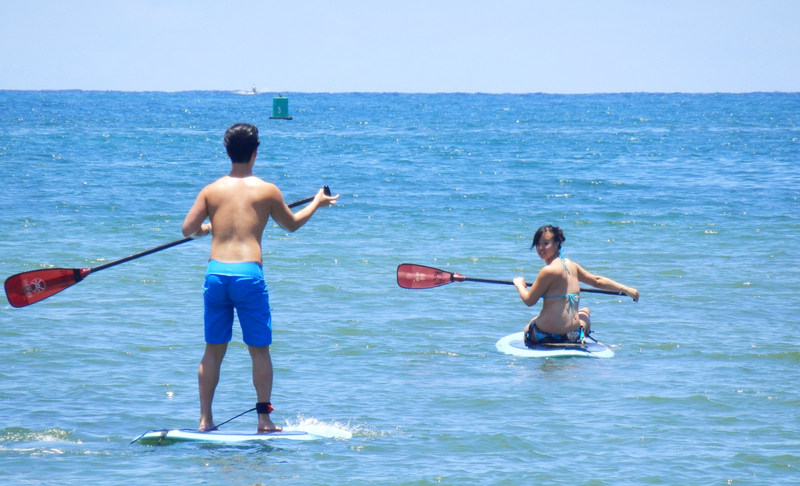 If you manage to make it to Haleiwa, along the northwestern side of the island, their SUP is amazing. There is an inlet you can paddle up with much calmer water. 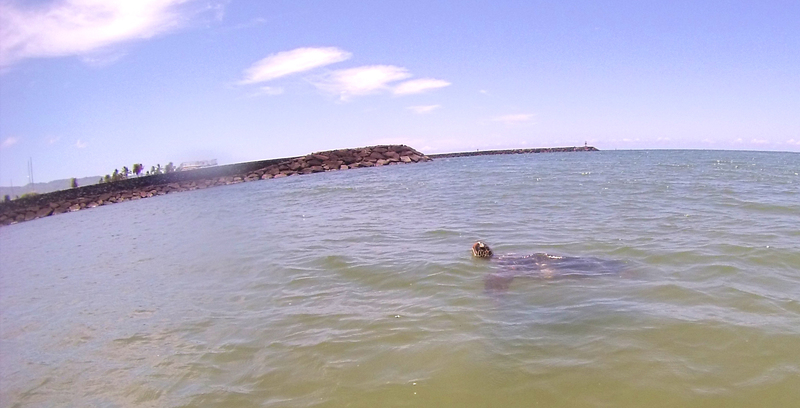 Along this inlet, you’ll find SO many sea turtles. We spotted 8+ just 40 minutes in. An amazing experience! Trying my best to stand up on the board. They’re wide and more stable than surfboards so its not actually as hard as it looks. FrostCity: great shaved ice. Our friends Stephen and Danielle took use here and it was one of the best I’ve ever had. Bubbies: around the corner from Frostcity is Bubbies, serving ice cream and mochi. SO GOOD. 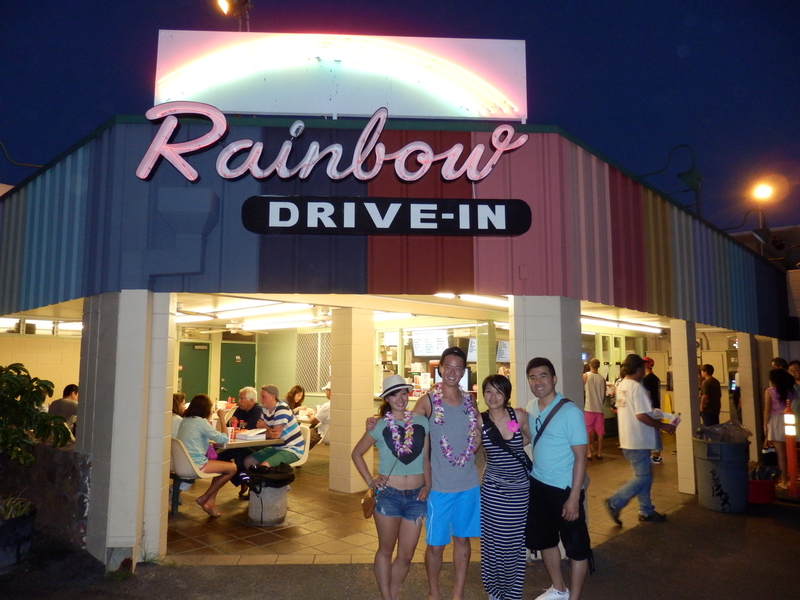 Rainbow Drive-In: Ugh I know…SO TOURISTY! It’s been featured on DDD with Guy Fieri, not that it wasn’t busy before. Stephen and Danielle took us here and I had my first loco moco. Not too shabby at all! Costco: OK if you wanna try cooking stuff yourself, the Costco is a great place to start. Great, fresh seafood, cheap souvenirs (macadamia nuts of every variety in giant boxes) and the best poke (seasoned raw fish. 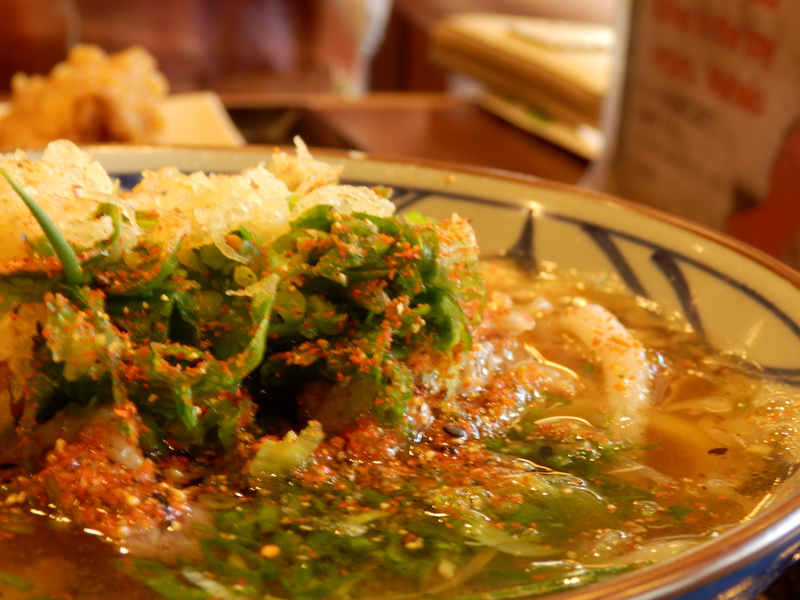 Pronounced Po-ke) I’ve ever had. Very first loco moco. 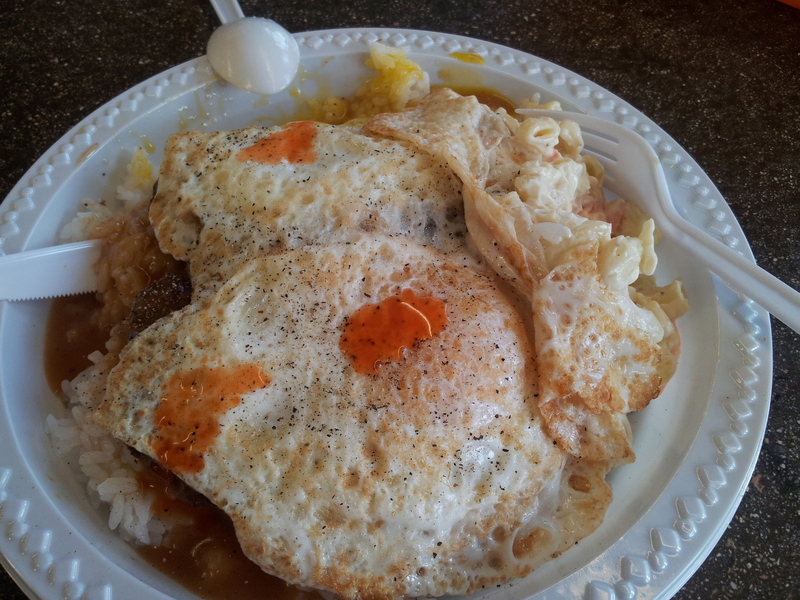 Eggs, rice, meat, gravy…what’s not to like? Thank you Stephen and Danielle for driving us around and taking us to eat 😀 Aloha! Lace up those Hiking Boots and Find a Trail! All the Hawaiian Islands are volcanic in nature, which makes for amazing scenery and great hikes with varying difficulty levels to suit all fitness levels. 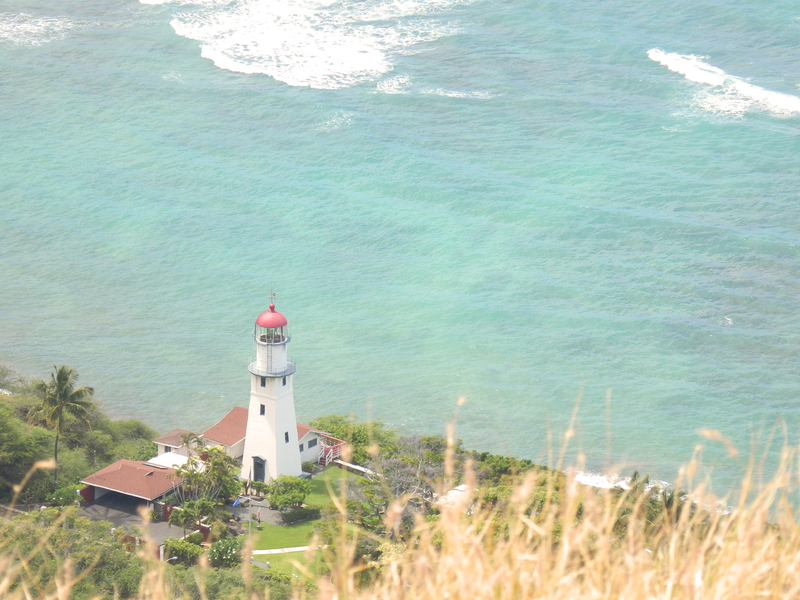 Start with the Diamondhead hike, a great beginner hike easily accessible through public transit that runs along a dormant volcano. The peak offers wonderful views of both the ocean and the city itself. If you’re a little more experienced, make sure to check out the Olomana trail, also accessible through public transit. Check out my guide on how to do this awesome trail here. The views up there are truly amazing and worth every bit of effort. 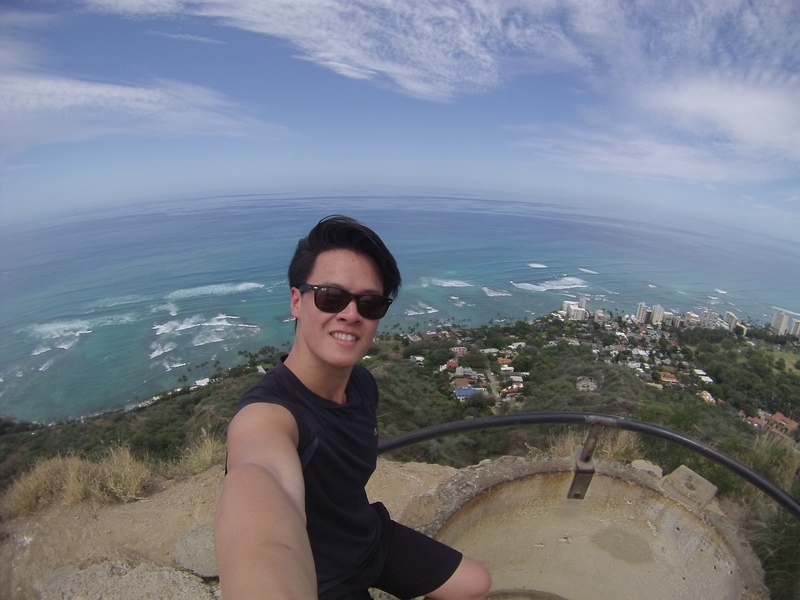 I will note that I wanted to hike Koko Head but did not make it out there in the end. Its a challenging hike through mountains and waterfalls but the view is supposed to be amazing. If you’ve ever been please comment and let me know how it was! These two images say it all. Taken from peak 1 of the Olomana trail. Views of peak 3 and beyond. 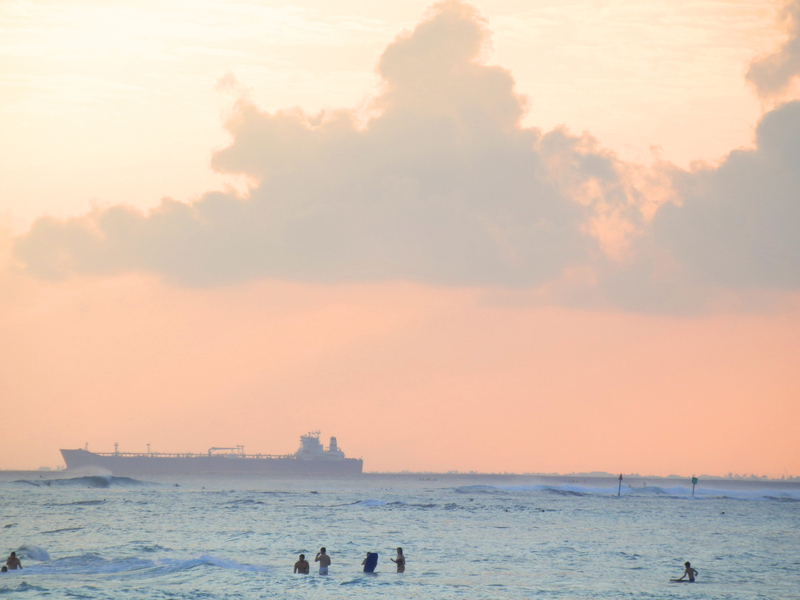 If you want to see what’s beyond the borders of Waikiki, rent a car and go out to explore. You can make it around the island in one day and see many of the things along the way. When my parents finally joined us, we rented a car and made our way to Mokuleiwa Beach Park near the most western tip of the island for a very secluded beach to enjoy and share with only 5 other people. We also passed through the Pali Lookout for some truly spectacular views. Continuing around the island, we made our way to Sandy Beach, for long stretches of sand and amazing waves. This is a great place to catch the surfers do their thing. If you see something interesting alone the way, just stop and check it out! 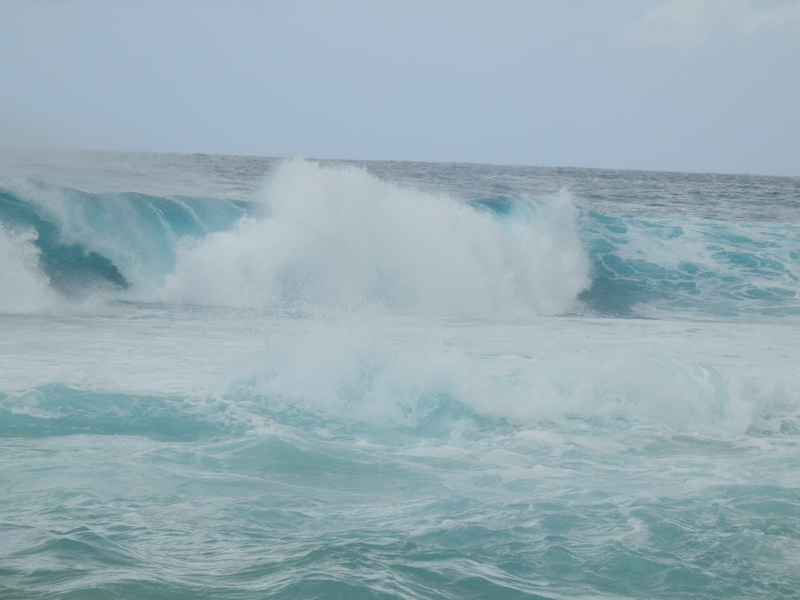 Big waves at Sandy Beach. Lots of surfers here. 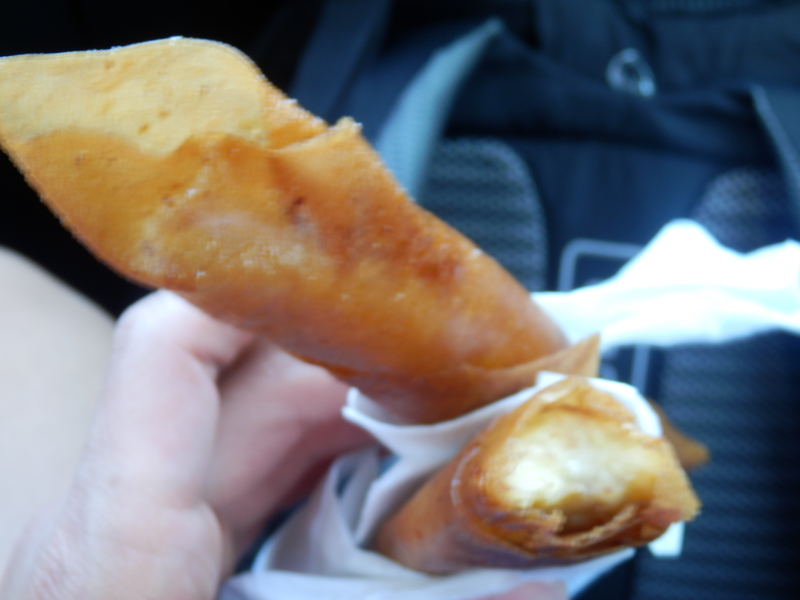 We stopped by a roadside market and I found these Filipino spring rolls (Lumpia) with plantain and peanuts. I may have mentioned in my post about Pandan Island that these were the most amazing desserts I’ve had in a while! 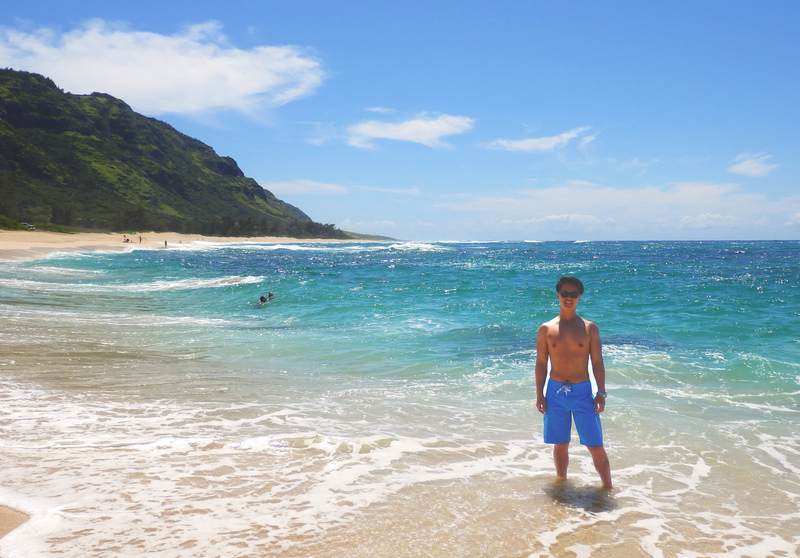 So those were some of my favourite things to do in Honolulu. There are tons of things I didn’t get to do like SCUBA in Shark Cove and Hanauma Bay (surf made visibility horrible so wasn’t worth the money) and shark caging (is that a verb?). Hawaii is full of friendly people, cheery music, sunny days and beautiful landscapes. If you do anything at all, grab a icy cold drink and sip it as you watch the sun set on a beach of your choice. Whether that’s in the ultra secluded Mokuleiwa Beach, or the well serviced Waikiki beach, Hawaii is the ultimate place to unwind and soak in that UV!